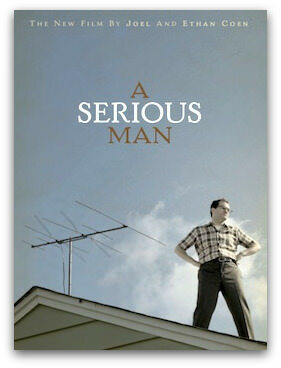 A Serious Man (Rating). Running time: 105 minutes. Director: Ethan and Joel Coen. It’s 1967, and Jewish uni professor Larry Gopnik (Michael Stuhlbarg) has got the weight of the world bearing down on his shoulders. His wife is set to leave him for the most annoying man alive, a series of anonymous and slanderous letters are threatening his chances for tenure, one of his students seems to be trying to bribe him, his two kids treat him like a combination cash machine and TV repairman, his brother has moved in and keeps babbling about some kind of mathematical gambling scheme he’s figured out, his neighbours on either side look like they’re up to something devious, and whenever Gopnik turns to his rabbi for help all he gets are long-winded and nonsensical stories. Maybe if he could figure out some meaning behind all this he’d be able to endure. Sadly for him, any kind of higher meaning (or even narrative closure) is currently in short supply. The Coen Brothers (Burn After Reading, Fargo, No Country for Old Men) are back doing what they do best with this deeply quirky, murkily personal, often hilarious and rarely obvious film. The tone is set with a prologue set in the 19th century. It has the shape of a folktale but without any clear meaning, let alone relevance to the story that follows. The stress placed on Gopnik’s Jewishness feels like it might provide some clue to his suffering, but the various rabbis he visits prove to be useless or worse. Perhaps the looming counter-culture might provide a way out of his troubles, but that’s a dead-end too. And if you’re expecting any kind of tidy conclusion to his struggles and strife, you’re in the same boat as Gopnik. Which is probably the Coens’ point. For once in the Coens’ recent comedies not everyone here is an idiot, but not being an idiot doesn’t help Gopnik much, as his world continues to spiral out of control to the lack of interest of all. His increasingly desperate search for answers – or even just an explanation as to why all this is happening to him – is clearly futile, but what else can he (or any of us) do with our lives? In some ways this could be seen as a rebuke to those critics who’ve complained that their previous films were populated largely with dimwits: if Larry was only a little more of a dimwit himself, he might be a lot better able to cope with his ordeal. There's a lot to think about and laugh at in this lovingly crafted film. For some the lack of easy answers could be frustrating. But if you’re willing to just go along with the ride, you’re bound to enjoy what is one of the Coens’ best films in recent years. Anthony Morris is Forte magazine's film editor and The Big Issue's DVD editor. He also contributes reviews to The Geelong Times, Empire magazine, and websites WebWombat and The Vine.